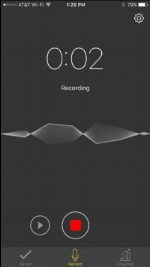 Use the Earshot app on your smartphone to record and upload. Earshot is FERPA compliant and data privacy is a priority. Once a recording is uploaded it is deleted from your phone.